Independence Day in the United States, which is on the fourth of July, is just around the corner, and with it comes the traditional holiday festivities, fireworks, and waiving of American flags. This year, over half a million immigrants will join in the celebration as newly naturalized US citizens. This spotlight examines foreign nationals age 18 and older who became US citizens (i.e., naturalized) in 2010. Unless otherwise noted, the data presented are from the Department of Homeland Security's Office of Immigration Statistics (OIS) Annual Flow Report on the number and characteristics of foreign nationals who naturalized in 2010, as well from tables available on the OIS website. Note: all yearly data is for the government's fiscal year of October 1 through September 30 of the given year. There were 16.8 million naturalized citizens in the United States in 2009. In 2009, an estimated 7,870,000 lawful permanent residents were eligible for naturalization. In 2010, US Citizenship and Immigration Services (USCIS) naturalized more than 600,000 legal permanent residents. USCIS denied 56,990 naturalization petitions in 2010. About 290,000 applications for naturalization were pending a decision at the end of 2010. The number of naturalizations decreased by 40.8 percent between 2008 and 2010. 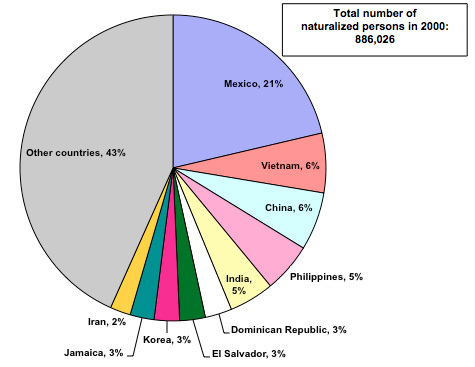 In 2010, immigrants from Mexico, India, the Philippines, and China accounted for almost one-third of all naturalizations. Of all Mexican immigrants naturalized in 2010, nearly 70 percent resided in California, Texas, Illinois, and Arizona. Half of all foreign born who naturalized in 2010 lived in four states: California, New York, Florida, and Texas. Wyoming had the fewest naturalizations of all states in 2010. The term "foreign born" refers to people residing in the United States at the time of the census who were not US citizens at birth. The foreign-born population includes naturalized citizens, lawful permanent immigrants, refugees and asylees, legal nonimmigrants (including those on student, work, or certain other temporary visas), and persons residing in the country without authorization. The New York, Los Angeles, Miami, and Chicago metropolitan areas were home to more than one-third of all immigrants who naturalized in 2010. The median number of years of residence between the date of legal immigration and the date of naturalization was six years in 2010. A July 2002 executive order made noncitizen members of the armed forces eligible for expedited US citizenship. Almost 69,000 immigrant service members have become US citizens since September 2001. Of the 38.5 million immigrants residing in the United States in 2009, 16.8 million (or 43.7 percent) were naturalized citizens, according to 2009 American Community Survey (ACS) estimates. According to the latest available OIS estimates, there were 12.5 million lawful permanent residents (LPRs) who resided in the United States as of January 1, 2009. Of them, about 7.9 million were eligible to naturalize. To be eligible for naturalization, an immigrant must be at least 18 years of age; have lawful permanent residence (a green card) for at least five continuous years (three continuous years if the individual is married to a US citizen); have no criminal record; possess the ability to read, write, and speak simple words and phrases in English; and have knowledge and understanding of American history fundamentals and US government principles. The USCIS received 710,544 applications for citizenship and naturalized 619,913 legal permanent residents in 2010 (See Figure 1, below). Applicants can be denied citizenship by USCIS for one or more of the following reasons: if the applicant cannot prove five years of permanent residence in the United States; if the applicant is found to lack allegiance to the United States; if the applicant is found to have bad moral character; or if the applicant fails the required English language or American civics test. Overall, the agency denied 56,990 applications in 2010. The number of applications pending a decision decreased from 480,000 at the end of 2008 to 290,000 by the end of 2010. In the period between 2008 and 2010, the number of naturalizations decreased 40.8 percent. In 2009, there were 743,715 naturalizations, a decrease of about 28.9 percent from 2008, and in 2010 there were a total of 619,913 naturalizations, a decrease of 16.6 percent from 2009. Source: Yearbook of Immigration Statistics, 2010. Available online. In interpreting the data presented in Figure 1, it is important to note that the increased number of naturalizations in the second half of the 1990s resulted in part from legislation passed in 1986 and 1996. Under the 1986 Immigration Reform and Control Act (IRCA), 2.7 million unauthorized immigrants received lawful permanent resident (LPR) status, increasing the pool of those eligible for naturalization. The sharp increase in naturalizations of about 58.5 percent between 2007 and 2008 (from 660,477 to 1,046,539) is a result of the promotion of naturalization during the 2008 presidential elections and impending increases in the fees assessed for applicants, which worked to encourage a surge in applications for naturalizations during that time period. Since 1996, the number of people naturalizing every year has not always matched the number of people applying for naturalization due to delays in application processing. Therefore, readers have to exercise caution in interpreting trends in naturalization over time. Of all immigrants who naturalized in 2010, 10.8 percent were born in Mexico (67,062), 9.9 percent in India (61,142), 5.7 percent in the Philippines (35,465), and 5.5 in China (33,969). Nationals of these four countries, together with those from Vietnam (19,313, or 3.1 percent), Columbia (18,417, or 3.0 percent), the Dominican Republic (15,451, or 2.5 percent), Cuba (14,050, or 2.3 percent), Haiti (12,291, or 2.0 percent), and Jamaica (12,070, or 1.9 percent), accounted for 46.7 percent (289,230) of all naturalizations in 2010. (See Figure 2.1). Three countries that had previously been among the top ten origin nations for new US citizens in 2000 — Korea, Iran, and El Salvador — were replaced by Colombia, Cuba, and Haiti in 2010, while the other seven of the top ten from 2000 remained in place (see Figure 2.2). More than one-third (36.5 percent) of the 67,062 Mexican-born LPRs naturalized in 2010 resided in California (24,446), while 21.5 percent resided in Texas (14,416), 6.2 percent in Illinois (4,134), and 5.6 percent in Arizona (3,768). In 2010, 20.9 percent of all immigrants who naturalized lived in California (129,354), 11.0 percent lived in New York (67,972), 10.9 percent resided in Florida (67,484), and 8.0 percent were in Texas (49,699). (See Table 1). In Wyoming, just 229 legal permanent residents naturalized in 2010. The next-lowest numbers of naturalizations were in Montana (259) and North Dakota (286). Around 15 percent of all those who naturalized in 2010 lived in the greater New York metropolitan area (91,257), 8.4 percent resided in the greater Los Angeles metropolitan area (51,977), and 6.8 percent lived in the greater Miami metropolitan area (42,220). These metropolitan areas, together with the metropolitan areas of Chicago (4.0 percent), Washington (4.0 percent), San Francisco (3.4 percent), Houston (3.0 percent), Boston (2.7 percent), and Dallas (2.7 percent), were home to roughly half (49.8 percent) of all new US citizens in 2010. Among persons who became US citizens in 2010, the median number of years of residence between the date of legal immigration and naturalization was six years. The median time of residence for new citizens in 2009 was seven years, while the corresponding figure in 2008 was nine years. Section 329 of the Immigration and Nationality Act authorizes the president to issue executive orders specifying periods of conflict during which foreign-born members of the US military are eligible for immediate US citizenship. Since September 2001, 59,647 foreign-born military personnel have naturalized on US soil. Another 9,327 have become citizens overseas or aboard US Navy ships. Between 2005 and 2011, the majority of foreign-born service members naturalizing overseas were naturalized in Iraq (3,379 individuals), Japan (1,777 individuals), and Germany (1,272 individuals). Nearly 900 persons were naturalized in Afghanistan during the same period. Since August 2002, USCIS has also granted posthumous citizenship to 132 members of the military. 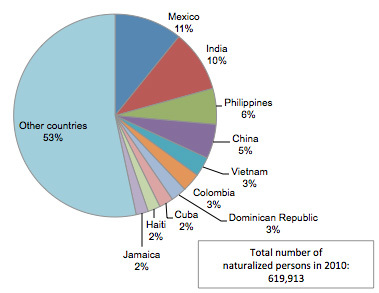 DHS Office of Immigration Statistics: Data on Naturalizations, FY 2010. Available online. Rytina, Nancy (2010). "Estimates of the Legal Permanent Resident Population in 2009." USCIS, February. Available online. USCIS, "Fact Sheet: Naturalization through Military Service." Available online. Definitions of terms can be found at the website of the Department of Homeland Security. Victoria Neilson is the Legal Director of Immigration Equality, a national organization fighting for equal immigration rights for the lesbian, gay, bisexual, transgender and HIV-positive community. Ms. Neilson runs Immigration Equality’s pro bono asylum project and provides technical assistance and mentoring on LGBT and HIV immigration issues to attorneys around the country. She is the primary author of The LGBT/HIV Asylum Manual, a comprehensive guide for attorneys, and she has published extensively on legal issues facing LGBT and HIV-positive immigrants and refugees. Ms. Neilson received her law degree from the City University School of Law and her bachelor’s degree from Harvard University. Ms. Neilson is co-chair of the New York City Bar Association’s Committee on AIDS and an active member of the American Immigration Lawyers Association. She is the former Litigation Director at the HIV Law Project in New York. Jeanne Batalova is a Political Analyst at the Migration Policy Institute, where she focuses on the impacts of immigrants on social structure and labor markets; integration of immigrant children and elderly immigrants; and the policies and practices regulating immigration of highly skilled workers and foreign students. She is also Manager of the MPI Data Hub, a one-stop, web-based resource that provides instant access to the latest facts, stats, and maps covering US and global data on immigration and immigrant integration.